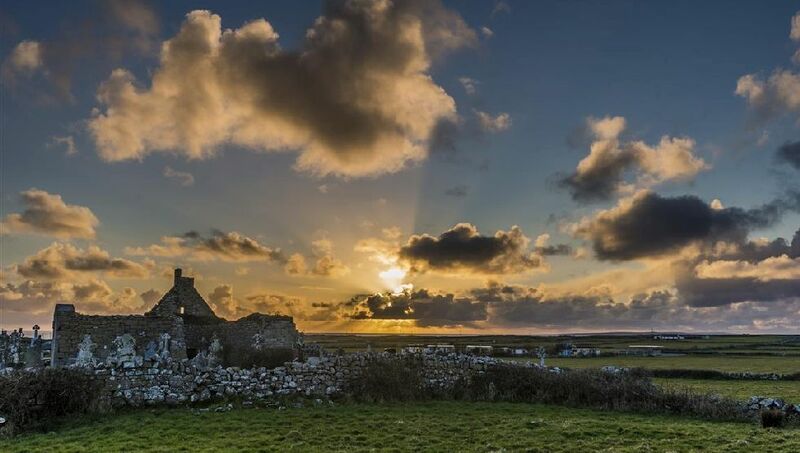 For those interested in finding out more about Doolin’s background we have compiled a 6 day itinerary which includes visits to historical sites and cultural experiences that will help you understand our heritage in order to enjoy your stay even more. When you arrive in Doolin, check in at your accommodation. You will get a warm Irish welcome and your host will provide you with all the information you need such as maps of the area, itineraries, suggestions for places to eat and where to listen to music. 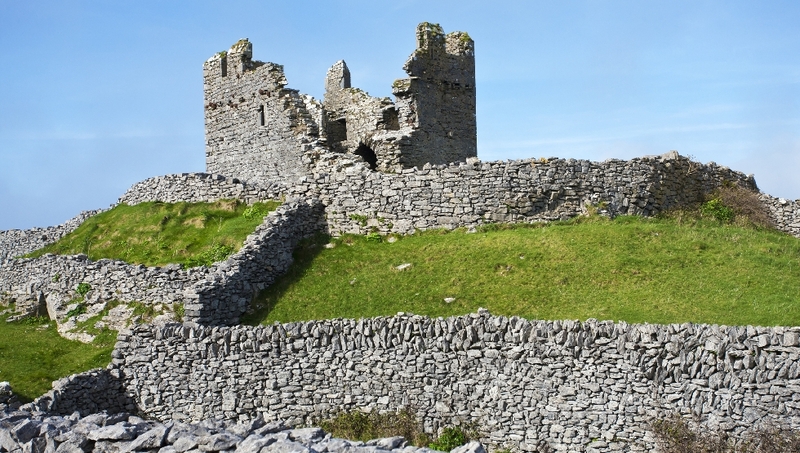 The Doolin Heritage Walk with archaeologist Joseph McCooey and Heritage Committee member Sean O’Connor is the best way to get to know all the details about Doolin and its rich heritage. 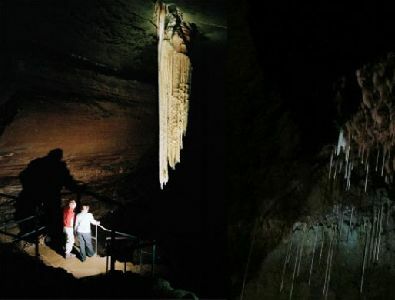 A visit to Doolin Cave in the evening would be the icing on the cake and the guides at the cave will provide you with great information about the cave system and geology of the Burren. Then it will be time to get ready for some great food in the pubs and restaurants of Doolin and also to catch some amazing traditional music which is probably Doolin’s most famous cultural heritage ! From Doolin, drive to Lisdoonvarna and stop at the Victorian Pump house (Lisdoonvarna Spa Wells) where a guide is there to tell you all about the history of the wells over the last 300 years. Continue onto the R476 towards Kilfenora where you will find the Burren Centre. 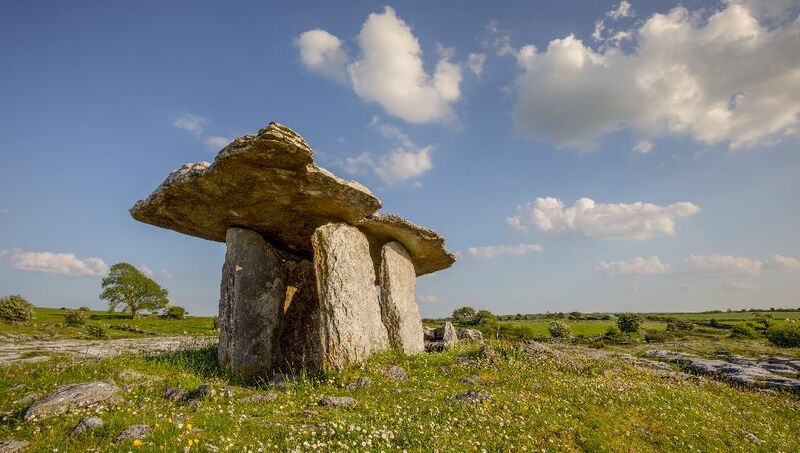 Start with an audiovisual display before enjoying the exhibition that enables the visitor to experience the development of the Burren from its formation over 320 million years ago to its present culture. Make sure you also take a look at the Kilfenora Ceili Band Parlour, which retraces the history of Ireland’s most famous Ceili Band. 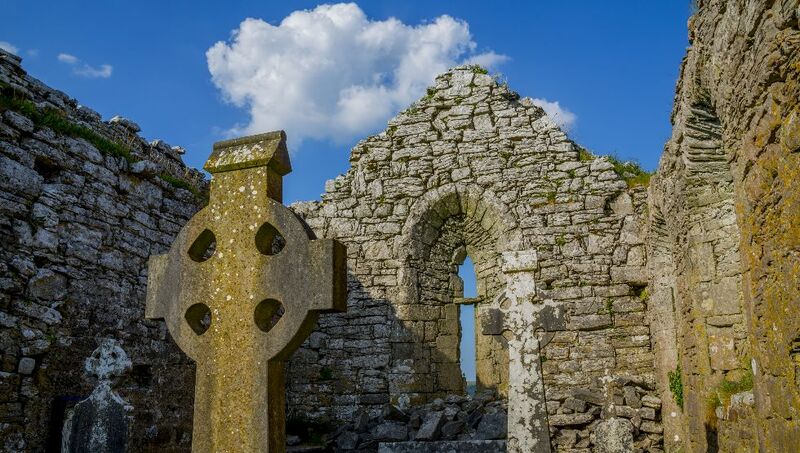 Right beside the Burren Centre, you will find Kilfenora’s old church, St Fachnan’s Cathedral, which was built in the 12th Century on the site of an early monastery. It is home to Doorty Cross and Kilfenora, also known as ‘the city of the Seven Crosses’, has one of the greatest concentration of high crosses in Ireland. Take the R476 again towards Corofin and after 6km you will reach a junction at Leamanagh Castle. Take a left on R480 and that will bring you to Caherconnell Stone Fort. The Visitor Centre will provide you with a lot of information on the history of the area and you can also enjoy a self-guided tour of the ringfort. Sheepdog demonstrations are also available at Caherconnell. Then keep driving on R480 for 1km and you will see the car park for Poulnabrone Dolmen on your right. Poulnabrone is the most famous dolmen (portal tomb) of the Burren and the short walk from the car park is marked with very informative signs. 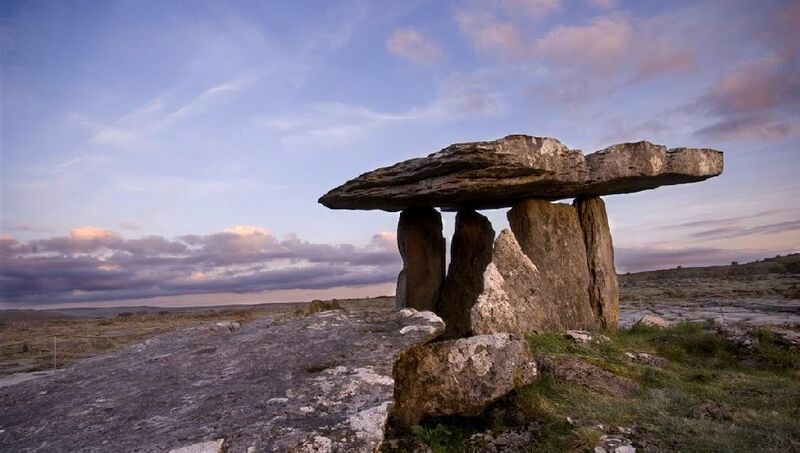 Continue onto R480 and enjoy the Burren landscape and the wonderful views at the top of the mountain. On your way down, you will pass Aillwee Caves, which offers wonderful guided tours of the stunning caves and also fantastic flying displays of birds of prey. 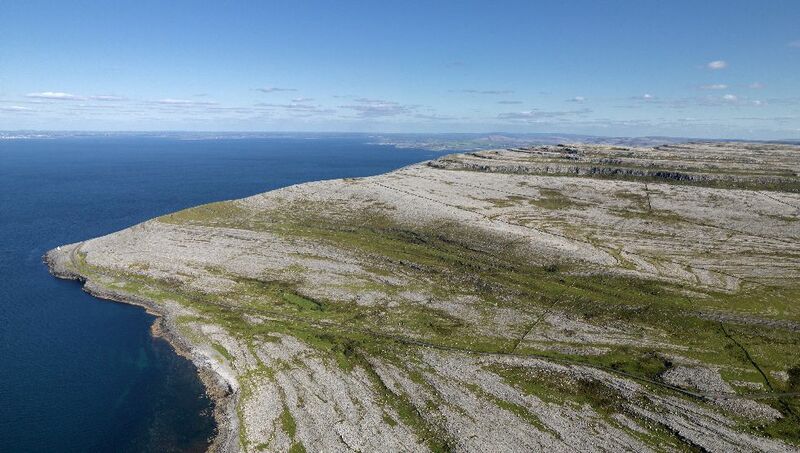 After visiting Aillwee Caves, continue towards Ballyvaughan and then drive taking the Burren Coast Road (R477) and enjoy the stunning views over Galway Bay, the coastline made of Limestone pavement and make sure to stop at Fanore’s beautiful beach before coming back to Doolin. Ennis is approx 40 minutes’ drive from Doolin. Park in the town centre, everything is accessible on foot once you’ve parked. There is a guided walk that starts every morning at 11:00 from Ennis Tourist Office and it is a great way to discover the town and its history. After the walk, pop into the Clare Museum for some local history and then visit the Franciscan Friary, a medieval building from the 13th century, before getting into your car again after some lunch in one of Ennis’ numerous cafés, pubs and restaurants. After your visit of Ennis town, drive towards Quin on the R469 for about 11km (20 minutes) and follow the signs for Quin Abbey. The abbey was founded in the 14th century and the view from the top of the tower is impressive. Tours are also available. Back on the R469 then for a short 9km drive (15 mins) to Craggaunowen. This is the home of the ‘Living Past Experience’, an award-winning prehistoric park. 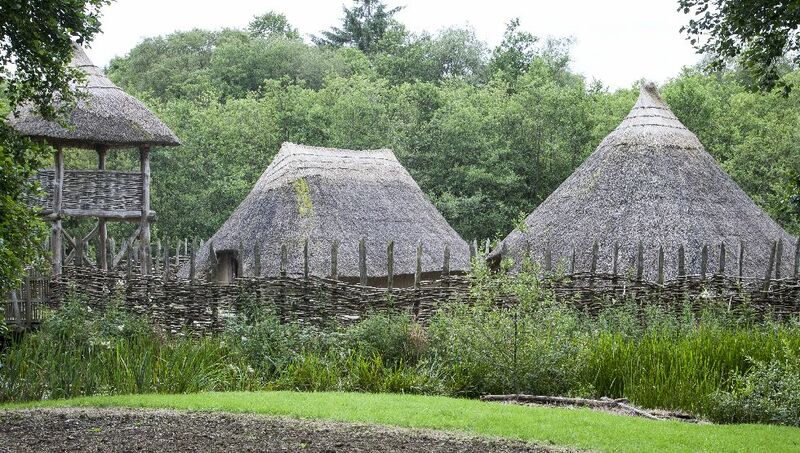 Explore the roots of the people, homesteads, animals and artefacts of Ireland’s Celtic ancestors and experience what life was like on a crannog (a reconstructed lake-dwelling or artificial island) and many more attractions including the ‘Brendan Boat’, a reconstitution of the boat St Brendan The Navigator used to cross the Atlantic and discover America long before Colombus. Not only are the Cliffs of Moher one of the most magnificent natural wonders in the world but they are also a landmark of North Clare history and feature in many Irish legends. 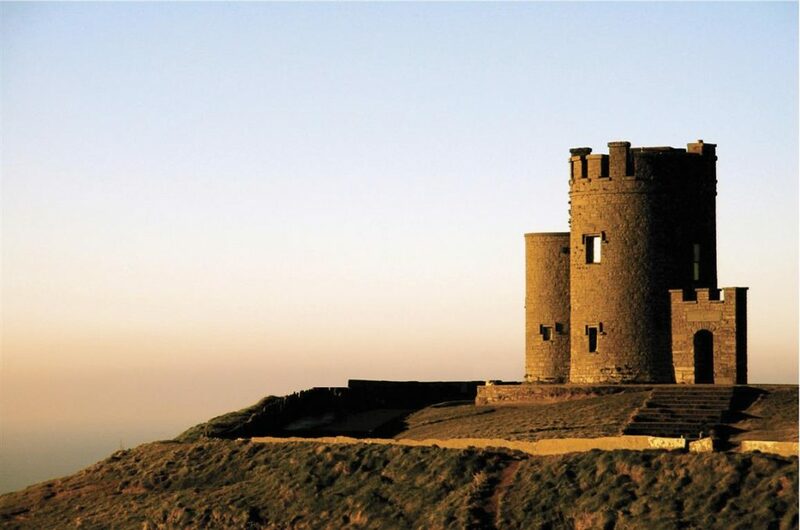 From O’Brien’s Tower, built in 1835 for tourism purpose by visionary Cornelius O’Brien, to the ruins of Moher Tower at Hag’s Head, enjoy the stunning Cliffs walking trail before visiting the Visitor Centre which will provide you with many information about the geology and history of the area. A section of the exhibition is also dedicated to John Philip Holland from Liscannor, who is regarded as the father of the modern submarine. When you leave the Cliffs of Moher, follow the R478 towards Lahinch via Liscannor. Lahinch is home to a famous golf course and is also well-known for its beautiful beach and promenade. It is a nice place to stop for lunch as they are many cafés and pubs in town. Leave Lahinch using the N67 and drive 5 minutes towards Ennistymon. About a mile before reaching the town, stop at the Famine Memorial, located across from Ennistymon Hospital which was built on the site of the old workhouse where about 20,000 people died during the Great Famine. 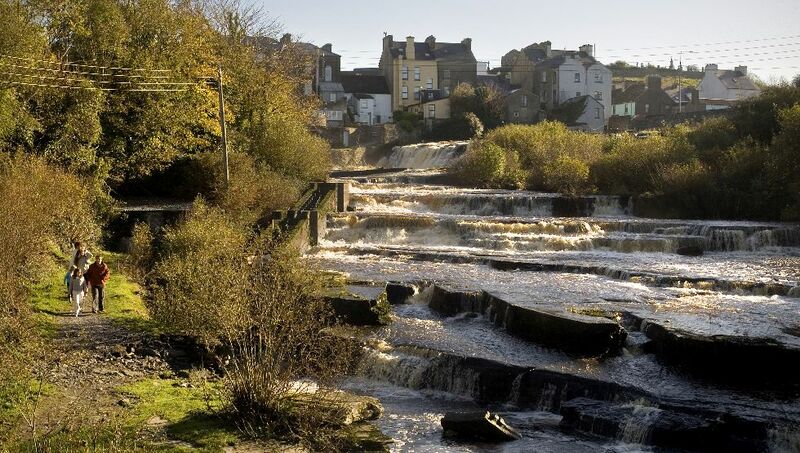 Ennistymon, the largest town in North Clare, has a very rich historical heritage for you to discover and a great way to do so is to follow the Ennistymon Historical Walk which features all the main sights (the courthouse, old ruined church and graveyard, West Clare Railway bridge, etc.). The walk ends at the Falls Hotel and its wonderful view over the cascades. The hotel conceals within its walls an eighteenth century mansion, a late medieval castle and a formidable history of four and a half centuries embracing clans and warfare, landlords and tenants, poets, dreamers and entrepreneurs. A great place to stop for a cup of tea or a bite to eat before returning to Doolin ! 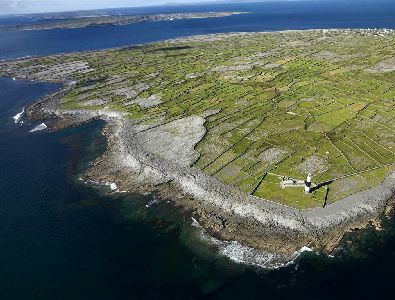 Take a day trip to Inis Oírr, the smallest of the Aran Islands, which is a short 30 minute boat ride from Doolin Pier with one of the ferry companies. Inis Oírr has probably been inhabited for over 5,000 years but the earliest evidence of civilisation is at Cnoc Raithní, a Bronze Age burial mound dating from 1500BC. 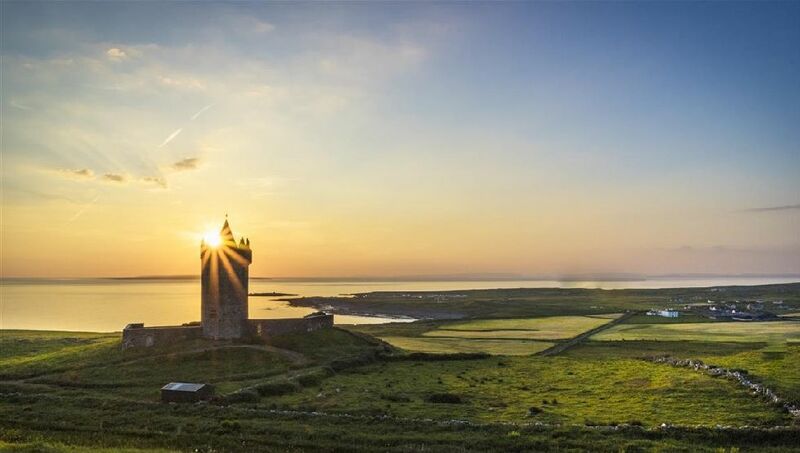 Nearby are Teampall Chaomhán, a Medieval church ruin half buried in the sand and the 16th Century Caisleán Uí Bhríain, an imposing three storey tower house built within a Stone Age fort. The shipwreck of the Plassey is also a famous sight and while you discover the island’s rich history you will also enjoy its beauty and tranquility, stunning views over the Cliffs of Moher and many stonewalls. You should also visit Áras Éanna, Inis Oírr’s arts and heritage centre housed in a renovated weaving factory, which offers exhibitions and workshops. Drive towards Lisdoonvarna and then take the R476 towards Kilfenora and keep driving until you reach a junction at Leamanagh Castle. Take a right on R480, and then take the second road to the right (L1014) which will bring you to the Michael Cusack Centre. 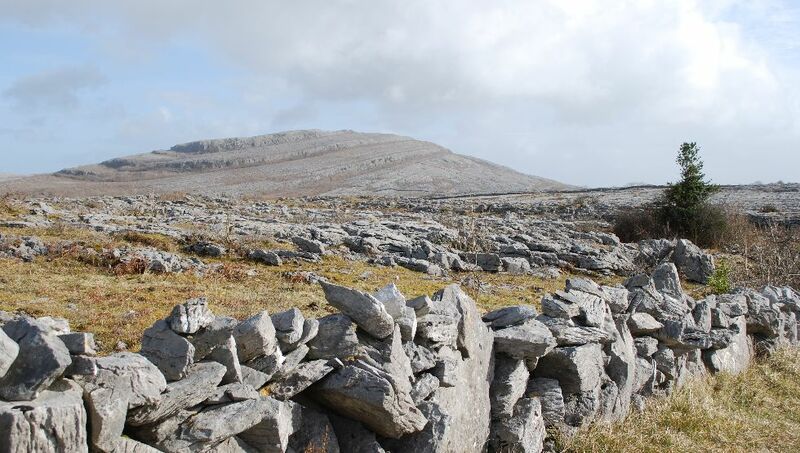 Situated in the heart of the Burren, the centre is dedicated to the extraordinary life of Michael Cusack, one of the founding member of the Gaelic Athletic Association (GAA). Drive back to the junction at Leamanagh Castle and take a left onto R476, continuing your journey towards Corofin. Visit the Clare Heritage & Genealogy Centre and its museum before driving the R460 towards Gort. 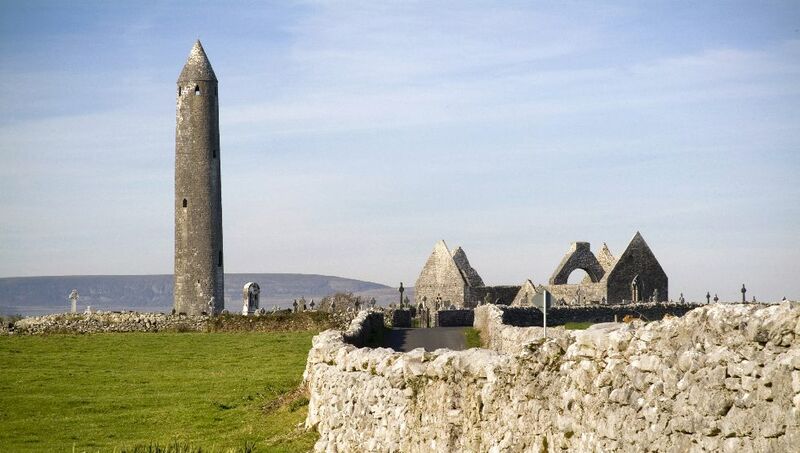 Before you reach Gort, Kilmacduagh Abbey and its famous round tower will be on your left. The monastery was founded in the 7th century and became of importance in medieval times. The round tower is a fine example of this typical Irish feature and is also famous for leaning over half a meter from the vertical. 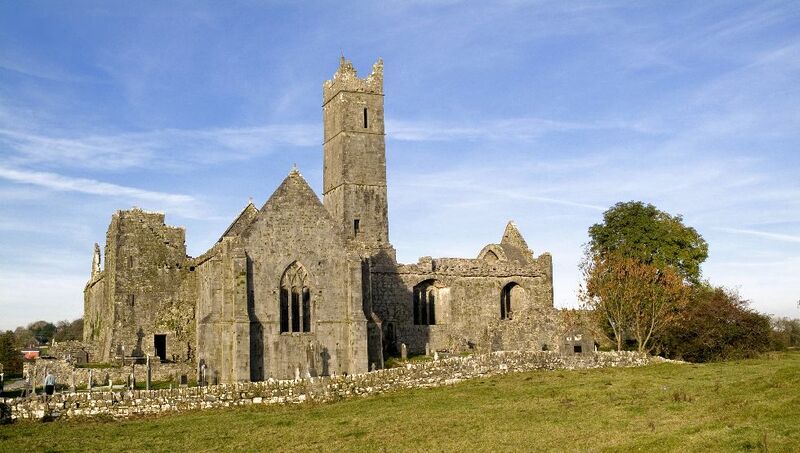 Once you have visited the Abbey, keep driving towards Tierneevin before taking a left on L4508 towards Kinvara. Kinvara is a lovely seaside town and home of Dunguaire Castle, built in 1520. The restoration of the castle started in 1924 when Oliver St. John Gogarty bought it. It became a famous venue for meetings of literary revivalists like J.M. Synge, W.B. Yeats and G.B. Shaw. Today, Dunguaire Castle is open to the public and gives an insight of the lifestyle of the people who lived from 1520 to modern times. After spending some time in Kinvara, take the N67 back towards Ballyvaughan. When you get to New Quay, you are very close to the Flaggy Shore, one of the most beautiful parts of the Burren coastline made famous by poet Seamus Heaney in his poem ‘Postscript’. Further down the N67 road, you will reach a junction at Bell Harbour from which you can get to the beautiful Corcomroe Abbey in just 5 minutes. 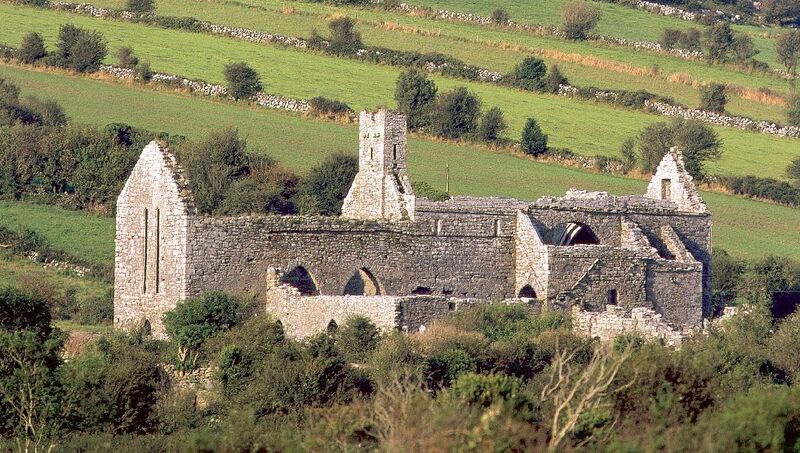 Corcomroe Abbey is an early 13th century Cistercian Abbey which is located on a beautiful site surrounded by the grey hills of the Burren. Then go back on the N67 and start your journey back to Doolin. After driving through Ballyvaughan, Gregan’s Castle is the perfect place to stop for a cup of tea and enjoy the wonderful setting of this hotel where J.R.R. Tolkien spent some time while in Ireland. Doolin is then only 20 minutes away, but make sure to enjoy the view at the top of the Corkscrew Hill on your way back !